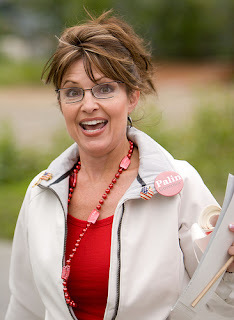 Following up on my post from yesterday -- "So is Sarah Palin running, or what?" -- I should note that signs are indeed pointing to YES. In a move designed to propel her closer to a presidential run, former Alaska Gov. Sarah Palin will set out on a bus tour of the country on Sunday, making stops at symbolic sites along the way. "Starting this weekend, Sarah Palin will embark on a ‘One Nation' tour of historical sites that were key to the formation, survival, and growth of the United States of America," SarahPAC treasurer Tim Crawford said in a statement to RealClearPolitics. "The tour will originate in Washington, D.C. It will proceed north up the east coast." Members of Palin's immediate family are expected to join her on the trip, which will eventually take her through key early-voting states. Now, look, I admit, I've long thought there was no way she was running. I've said that over and over again. It just didn't make any sense. Doesn't she have too much to lose? If she's all about cashing in on her stardom, which she seems to be, how would it benefit her to expose herself to the rigours of another political campaign -- one that would expose here even more as a vapid, self-absorbed fool? We saw how that went in 2008. One, she lives in a bubble, surrounded by sycophantic admirers who prop up the Sarah Palin myth, make her feel like she's the greatest person in the world, and tell her, one assumes, that America desperately needs her. No matter that she would likely get crushed to smithereens in a general election, particularly against Obama, and that's if she were even to make it that far, which she wouldn't, as the relatively saner elements of the GOP would rise up to make sure she didn't win the nomination. In her world, she's a winner and will always be a winner. Even when she loses. Two, it may be that she has more to lose not running than running, the reverse of what I thought. It's clear that her star is fading. She has her devoted followers, of course, but she's no longer a major go-to figure anymore, or at least not the way she was post-2008, up to last year's midterm elections. -- More and more people see her as a vapid, self-absorbed fool. -- Many on the right and throughout the Republican Party either dislike her immensely or wish that she would go away, including, it would seem, the head of Fox News, Roger Ailes, not to mention the entirety of the old-guard party establishment. -- Major events both at home and abroad have overtaken her and exposed her further as utterly unserious and possibly even dangerous, and without anything of value to contribute, events such as the Giffords shooting, the pro-democracy uprisings throughout the Middle East, the military intervention in Libya, the killing of Osama bin Laden, and the ongoing budget talks (with the GOP now the party of Paul Ryan, not Palin). -- And, what's more, as we focus more and more on 2012, what's the point of talking about her? She's been eclipsed by Republicans who are in the race or who otherwise have been major figures on the national stage, figures like Mitt Romney, Donald Trump, Newt Gingrich, Mitch Daniels, and Michele Bachmann. In other words, she's lost the spotlight, and what is she without it? It's not clear that her brand is suffering yet, but it will, eventually, unless she jumps back in. She can do that by agitating for the Tea Party, as she did last year, and by trying to present herself as a Republican kingmaker, but there other Tea Party Republicans who are far better spokespersons for a right-wing agenda, like Rand Paul, who actually holds office and isn't just a Facebook-based bobblehead, and her hold on the base just isn't what it once was, so it's hardly clear that she can wield all that much influence over party matters anymore. So what is she to do? Well, run for president. Makes sense, no? She won't win, as I said, but even in defeat she'd recover some of what she's lost. Her star would burn brighter again, if only for a time, and that's what it seems to be all about for her. It's fading, her stardom, but she could extend it by running. Or even -- as we're seeing now -- just by giving signs of a possible run, by releasing a hagiographic documentary, by getting on a bus and showing up where it matters. Notice how she's back in the news? Notice how we're writing about her again? This is what she wants. This is what she needs. This is what feeds her. Like any celebrity whose time is almost up, she's desperate for more, for the spotlight to shine brightly once more, for all the attention that fame brings. This is why she's back, and why she's dipping her toes into the pool. You really want back in, Sarah? Go for it. If they're for it, we're against it. Disney drops plans to trademark "SEAL Team 6"
So is Sarah Palin running, or what?